Why is pneumonia so common and severe in SCI? Is hospitalization necessary for pneumonia? Sleep Apnea-What is it? Why is it a problem? Most people probably think "ventilator" when they see the words "respiratory disorders" in relation to SCI. But only 5% or less of the SCI population use a ventilator after the acute period, according to Stephen Burns, MD , assistant professor in the Department of Rehabilitation Medicine. Far more common in people with SCI are respiratory infections, particularly pneumonia-now the leading cause of death in SCI-and sleep apnea (pauses in breathing at night). These problems are preventable and treatable, but many healthcare providers aren't aware they can be more severe in people with SCI, and that they require different treatments. 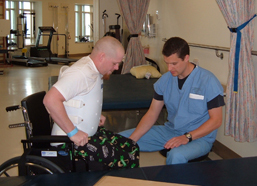 A rehabilitation medicine physician on the Spinal Cord Injury Service at the VA Puget Sound Health Care System, Burns is currently conducting a study of sleep apnea in acute SCI as part of the Northwest Regional Spinal Cord Injury System (NWRSCIS) . 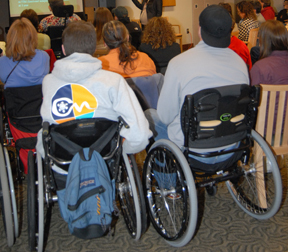 Much of the information he presented comes from a large VA database of about 15,000 patients with SCI, as well as the SCI Model Systems , of which NWRSCIS is a part. The VA Consortium for Spinal Cord Medicine will publish a set of guidelines on respiratory disorders in 2005; Burns is one of the contributors. "Respiratory infections, especially pneumonia, are the leading cause of death in SCI," said Burns (see figure 1, "10 Leading Causes of Death in SCI"), but account for less than 3% of deaths in the general population, most of whom die from heart disease, cancer and stroke, in that order (see figure 2, "10 Leading Causes of Death in the U.S."). Heart disease ranks second in the SCI population. Septicemia-infection that overwhelms the body- is third, and Burns surmises that this is probably what Christopher Reeve died from. Comparing rates of cause of death is only part of the picture, however. "Because people die at a somewhat younger age with SCI, especially in higher level injuries, the actual difference in risk is much greater," Burns noted. "The average SCI person's risk of dying of pneumonia is 37 times higher than general population." This represents a significant change from previous decades. "In the past, people died soon after injury," he said, "often within the first month, mostly due to urinary tract complications" before antibiotics were available, or to kidney stones and renal failure from recurring infections. Expiration, on the other hand, is a problem with all injury levels down to T12. The expiratory muscles are the intercostals-between the ribs-and the abdominals. During inspiration, the diaphragm functions like a bellows that pulls the lungs down, inflates them, and expands the chest cavity. Expiration requires the intercostal muscles to squeeze the ribs together and the abdominal muscles to push up and force air out. Consequently, "people with injuries down to T12 may have sufficient ability to move air in and out during regular breathing, but a profound weakness in their ability to cough," Burns said. "If you can't cough well, you can't bring up phlegm (mucus) from your lungs, and it starts pooling there." It's harder to treat respiratory infections in SCI patients because they can't clear their own secretions adequately. In time, breathing becomes harder as lungs fill with more secretions that prevent air from flowing. When a person develops too many secretions and doesn't have a strong enough cough to bring them up, secretions have to be mobilized (removed) in some other way. Antibiotic treatment . A common cause of pneumonia in the SCI population is the highly resistant, virulent bacteria Pseudomonas, rare in the general population, but more widespread in SCI due to frequent antibiotic treatment for other infections such as UTIs, or to multiple hospitalizations where these bacteria flourish, or both. Because Pseudomonas is resistant to many antibiotics and is associated with a high death rate, pneumonia in SCI patients should be treated aggressively with strong intravenous antibiotics. Because of the severity of pneumonia in the SCI population, Burns believes that "anybody with a complete cervical injury or anyone with a motor incomplete injury but a weak cough should be hospitalized." In the hospital, patients can be monitored more closely, secretions can be mobilized effectively, and if they need assistance with breathing they can be put on a ventilator within minutes. It's also easier to give antibiotics intravenously in the hospital than at home. Patients treated in hospitals with special SCI units have better outcomes (lower death rate) than those treated in general hospital units. "Some pneumonias are probably preventable with the vaccine Pneumovax ," Burns said. "Everybody with SCI should receive it once." Revaccination may be a good idea upon reaching age 65 if it has been more than 5 years since the last one. This vaccine has been in use long enough to be considered quite safe. Prevention strategies involve clearing and inflating lungs regularly, and need to be individualized according to how much difficulty each person has with secretions. Secretions need to be mobilized daily, whether through quad coughing or other methods, and full lung inflation should be accomplished daily using MI-E, ambu-bag (a self-inflating manual resuscitation bag) or glossopharyngeal breathing. "These methods need to be stepped up if a patient develops a cold, bronchitis, or some sort of upper respiratory infection, to keep it from developing into a pneumonia," Burns said. "The flu can make you just as sick (as pneumonia), and people can die from the flu," Burns stated. "Even if you consider yourself healthy, people with SCI are considered a priority group, and we recommend that they receive fly vaccine yearly." In spite of short supplies and rationing, there should be plenty of the vaccine available for high-risk patients. "Call ahead," Burns said. "If they're saying they're holding it only for people with high priority, you should easily be able to get it." Sleep apnea is defined as pauses that occur in the breathing at night, along with severe snoring ("everyone tells you your snoring is horrible") and/or excessive daytime sleepiness, Burns said. "Your sleep is disrupted, sometimes hundreds of times a night, and you're not getting restful sleep because your brain is having to wake up to tell your body to keep breathing." People usually have no awareness that they are waking up. In the general population, about 3-4 % of males and 1-2% of females have sleep apnea, and obesity is the main risk factor. Sleep apnea in the general population causes excessive daytime sleepiness, cognitive dysfunction (trouble thinking and concentrating), hypertension (high blood pressure), cardiac and pulmonary disease, and motor vehicle accidents. "If someone has high blood pressure that doesn't respond to the usual medications, there's a very good chance the person has sleep apnea," Burns noted. Sleep apnea is ten times more common in the SCI population, and occurs in up to 40% of persons with tetraplegia (quadriplegia). It is associated with obesity in SCI, but also with numerous SCI-specific factors, including muscle weakness (C5 and above have higher risk, even if incomplete) and medications such as baclofen. "Sometimes this is hard to sort out since people with SCI are often on meds that might make them sleepy anyway," Burns added. Sleep apnea in the SCI population causes all the problems of the general population, but also has the arguably more serious consequences of interfering with learning and improvement during the rehabilitation period; depression and difficulty with emotional adjustment; ulcer formation and poor wound healing due to low oxygen at night; even sudden death. 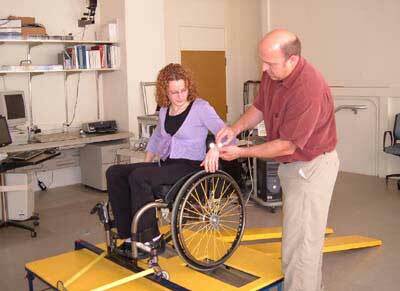 "Most people with SCI have enviably low blood pressure, like 90/45," Burns said. "But we found in our study that people with SCI who also have sleep apnea are more likely to have hypertension." "How bad the consequences are is essentially proportional to how bad the sleep apnea is," Burns concluded. "How frequently your breathing stops, how long it stops, how low your oxygen level goes. For some people it's mild; for others, it's going to shorten their lives." While symptoms such as severe snoring and sleepiness may indicate sleep apnea, the diagnosis can be confirmed with a sleep study called polysomnography, which Burns described as "a whole bunch of sensors hooked up to the body that measure your oxygen level; heart rate; chest expansion; whether air is blowing in and out of your mouth; whether you are asleep or awake according to EEG monitors on your head; whether you're snoring, (etc.)." The testing can be done in a sleep laboratory or at home using bedside equipment. At a minimum, a sleep test should record your oxygen levels at night, which would pick up the more severe cases, but doesn't tell you what type or if you have milder forms. As a result of Burns' study on sleep apnea and acute SCI, the Harborview Medical Center sleep lab has developed expertise working with SCI patients. "Most people improve if they can tolerate the treatment," Burns stated. The most common treatment is Continuous Positive Airway Pressure (CPAP) therapy, which consists of a bedside unit and hose that keeps the airway open by delivering pressurized air into the lungs through a mask worn over the mouth and nose (see figure 5, "Sleep Apnea Treatment"). Sleep apnea can also be treated surgically by taking out some of the extra tissue in back of the throat. This works in only about half the cases in the general population, but hasn't been studied in SCI patients. While CPAP is effective in the SCI population, it is tolerated less well in persons with limited hand function because of the inability to reposition the mask independently during the night. This can be improved with the help of an occupational therapist who can work with patients to modify the mask with a hook or ring so the user can make adjustments independently. "In a study we're finishing now, quite a few people with SCI are able to tolerate the mask," Burns said. "And they report large benefit." Most people with sleep apnea will need to use treatment like CPAP all their lives, Burns said, "unless one of the risk factors changes, like losing weight if weight was a cause." Patients usually notice a benefit right away and "don't want to be without (the CPAP equipment) or to travel without it. They feel more alert. That's the main thing people perceive. Heart problems like high blood pressure are more likely to creep up on people." In the general population, sleep apnea improves by sleeping on one's side or stomach instead of one's back. "But many people with SCI can't breathe well in that position; 65% of them sleep flat on their back," Burns added. Everyone with SCI has a high risk for pneumonia and influenza and should request immunization from their physician or medical center. It makes sense for people with cervical injuries to get baseline pulmonary function testing so clinicians know what their oxygen levels and breathing are normally like. "Then if someone gets sick (with a respiratory infection), we know what we're shooting for to get them back to their baseline," Burns said. Patients with symptoms of sleep apnea-excessive sleepiness during the day or loud snoring at night-may need a referral to a sleep specialist. "Keep in mind that in medical school, sleep gets one hour to cover everything-abnormal sleep, normal sleep, dreaming, insomnia, narcolepsy," Burns noted. "So most physicians know almost nothing about sleep apnea unless they specialize in sleep medicine or see a patient population with a lot of sleep apnea."